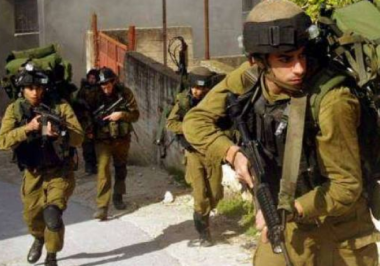 Israeli soldiers invaded, on Sunday at dawn, Jenin refugee camp, in the northern West Bank city Jenin, before storming and searching homes, and abducted two Palestinians. The invasion led to clashes, resulting in the injury of two Palestinians. Media sources in Jenin said dozens of soldiers invaded the refugee camp, before abducting Dia’ Mohammad Salama, 18, and Abdullah Qassem Sa’adi, 19, from their homes in the refugee camp. It is worth mentioning that Dia’ is the brother of Aws Salama, who was killed by Israeli army fire on July 12, 2017. Many local youngsters hurled stones on the invading Israeli military vehicles, while the soldiers fired concussion grenades, gas bombs and live rounds. Medical sources said the soldiers shot Bassem Ibrahim ‘Ammouri, 17, and Mohammad Osama Alawna, 17, with live rounds in their legs.